How digital shopping is pinching the sports apparel titan's business. Nike (NYSE:NKE) stock dipped after the company's latest quarterly results showed weak sales growth across its branded apparel portfolio. The company revealed a few surprisingly weak holiday-quarter metrics, including the fact that revenue gains didn't accelerate in the critical U.S. market as management had been targeting. 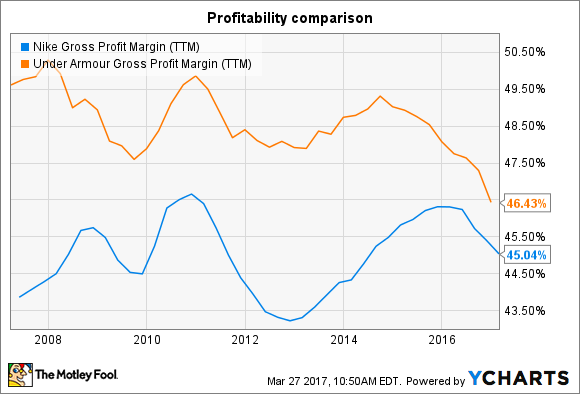 Profitability also continued to tick lower as Nike cut prices to lower its bloated inventory levels. Both challenges are driven by the same trend: Surging popularity for online shopping over physical trips to retail stores. Nike posted a 3% revenue improvement in the North American region, or the same pace it managed in the prior quarter. Over the last nine months, sales are up just 4% in the U.S., which marks a significant slowdown from last year's 7.5% gain. Executives described a tough selling environment at home. "The North America retail landscape is not in a steady state," Chief Financial Officer Andy Campion said in a conference call with investors. Nike's gross margin fell by 1.4 percentage points to 44.5% of sales, too, thanks to an increased reliance on price cuts. CEO Mark Parker pointed to e-commerce as the key factor behind both problems. "The consumer has decided digital isn't just part of the shopping experience," he said, "digital is the foundation of it." This surge toward the online channel helped drive a surprising shift in "consumer patterns, especially North America," he said, that hurt traffic and forced retailers into a more promotional selling stance. The good news is Nike's global footprint is coming in handy since only half of its sales come from the softening U.S. market, compared to 85% for Under Armour (NYSE:UA) (NYSE:UAA). It's no surprise, then, that Under Armour posted a more dramatic sales growth slowdown as gross margin dove by over 3 percentage points to 44.8% of sales. Since Nike can't do much about the weak broader industry trend, management's priority right now is to avoid flooding the retailing channel with products to add more pressure on them to cut prices as customer traffic declines. It has made solid progress on this score lately, with inventory down 8% last quarter. Its longer-term response will require bigger shifts. First, it includes doubling down on product innovations to keep its portfolio looking fresh to consumers who have a flood of options to choose from. The latest Air VaporMax shoe is a prime example. The product removes the need for a foam insole and has shed bulk and weight in the process, ideally earning a premium for Nike from its shoppers. The innovation battle will be competitive, given that Under Armour is also aiming to shift more upscale to avoid slumping prices at the value end of the market. "Our segmentation strategy could be sharper," executives admitted after missing their fourth-quarter growth forecast. "Being premium at every price point and having the right product for the right consumer is the price of admission." Nike already has a strong e-commerce presence. Growth last quarter clocked in at 18%, well above the total company's 7% gain. However, profit margins in this channel aren't likely to impress investors for a while, given that the company plans to invest aggressively to defend against online rivals. Meanwhile, the economics for its physical locations should improve over time as inventory levels better match up with the weaker shopping trends. Investors can expect sales growth and profitability to stay weak for Nike and its peers through this shift toward online shopping. Yet its global footprint, massive marketing budget, and quick innovation pace are all factors that suggest the business will fare better than rivals during this downturn.